A border is a line drawn around the inside edge of the paper. Usually this is 10mmm from the edge of the paper. It is basically a rectangle drawn precisely and inside this rectangle is the design area. A title block is normally drawn at the bottom of the paper. Inside the title block is printed important information such as Name, Title and Date. The measurements for the title block can be seen below (these can vary depending on the type of title block being used). All the lines are dark with the exception of the guidelines between which the printing is positioned. Below is a design sheet. 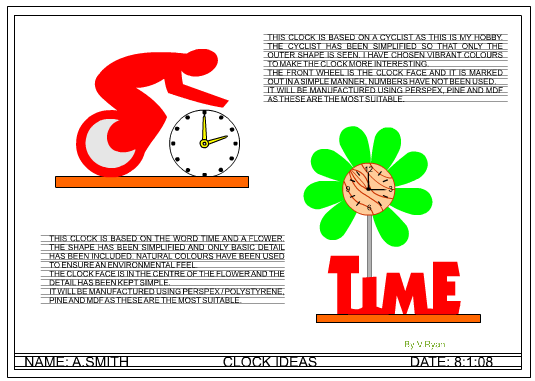 Ideas for modern, unusual clocks have been drawn on the sheet and detailed notes have been added. The border line and title block ensures that the design sheet looks more professional and includes vital information such as the designers name, the title of the sheet and the date. Faint guidelines have been drawn so that notes about each design can be added accurately. The next time you need to draw designs / ideas, draw a title and border line first. Also add notes by printing in BLOCK CAPITALS between faint guidelines.